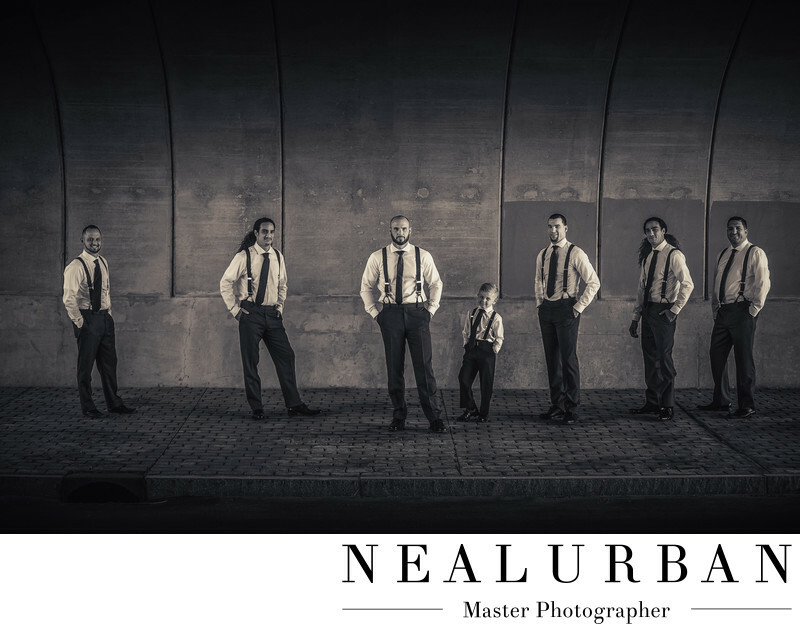 Country Matt of pit bulls and parolee's star poses with his groomsmen under a Bridge on his wedding day. The guys got ready at the Pearl at the Webb hotel room and he and his fiancé had a first look. It was a beautiful emotional moment between them. The Bride and Groom had beautiful chemistry. This photograph taken by Neal Urban at Tifft Nature Preserve in Buffalo, NY. This image represents how masculine the men are. It was mid-day with a bright sun so we took cover where it was shaded. They didn't have suit coats but had suspenders which was a great look. We added some playfulness with the ring bearer and their smiles. The poses and suits are GQ magazine style. We turned this photo to Black and White to add some drama. After taking photos of the guys we met with the girls in the nearby field with tall grass and rolling hills for some bridal party portraits. After 20 minutes of shooting we went to Pearl Street for their wedding ceremony and reception. They had a beautiful Friday wedding with perfect weather. Most of the images we created were bright and airy for the Bride who had a vintage wedding dress but dramatic for Country Rob.